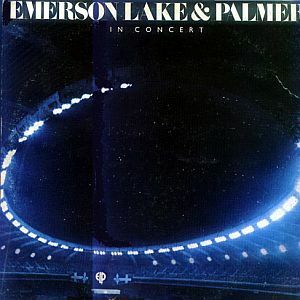 Recorded in Montreal's Olympic Stadium, In Concert was basically a contract-fulfilling album since the band had already broken up prior to this 1979 release. There really isn't anything spectacular about this album and for all intents and purposes, one might just consider it a supplement to the two previous live albums ELP released (Pictures at an Exhibition and Welcome Back My Friends...). Many of the selections are forgettable, but there are still some charming numbers like the cover of Henry Mancini's Peter Gunn, The Enemy God, and Knife Edge. Emerson's piano concerto piece is quite a sleepy affair. The recording is about average. Again, nothing spectacular. Just an average live album with so-and-so selections from a group that should have known better than to harp this onto their fans. Only the die-hards and collectors need to seek this out. Otherwise, I would recommend getting their re-released and repackaged Works Live, which also contains much junk, but at least has some of the better numbers from the Works tour. Two stars.